Nothing makes me happier than the weather giving me approval to toss all of my sweaters into a pile to be packed away, and take out my poor, long-lost shorts and tank tops out of their storage jail. With the exception of today (hello, snow in April! ), warm weather has officially graced us. My friend got sunburnt sitting on an outdoor patio for 2 hours last weekend, and I requested an outdoor table at the two restaurants I visited last week. With that being said, there have been a ton of Charlotte activities that I’ve been counting down the days until I could do them. Here is a list of activities that I will be checking off on my Charlotte-Warm-Weather Bucket List. Porch Drinking. Pick your favorite brewery or restaurant with a porch or patio to match your vibe. River Jam at the Whitewater Center. Every Thursday, Friday, and Saturday starting at 6pm and running from May-September! Bring a blanket, crazy creek, and your dog. Alive after Five at Rooftop 210. Every Thursday starting at 6pm! Live music and drinks on a rooftop patio in the middle of Charlotte. Craft City Social Club. Don’t live at a luxury apartment with a pool? No worries, Craft City Social Club, located at the top of the Sheraton Charlotte Hotel, has you covered. The only pool social club in Charlotte, Craft City Social Club allows you to hang by the pool and enjoy drinks, food, and games all summer long until September. Carowinds. Two weekends ago, the park had their season grand opening where they introduced their newest ride, Copperhead Strike. U.S. National Whitewater Center. For $59, you can spend the whole day white water rafting, ziplining, Stand-Up Paddle boarding, Kayaking, and rock climbing. Then you can round out the day with a cold beer and a delicious burger at River’s Edge, their on-site restaurant. Don’t miss their annual festival, Tuck Fest, happening April 25-28! The Quarry at Carrigan Farms. Have you been looking for a good place to jump off some rocks and into a body of water? Coincidentally, we know of just the place. Carrigan Farms in Mooresville offers Open Swim on select days of the season, where you can do exactly that. Open Swim is an alcohol-free event that costs $15 per person. The Open Swim season begins on May 27th, so check their website for details! Boating SZN. Having a friend with a boat has been a crucial part of a native Charlottean’s life since elementary school, and it is still necessary. Motor on over to the Sandbar to join hundreds of other boaters, or zip over to one of the dock-friendly restaurants and bars. Trolley Pub. 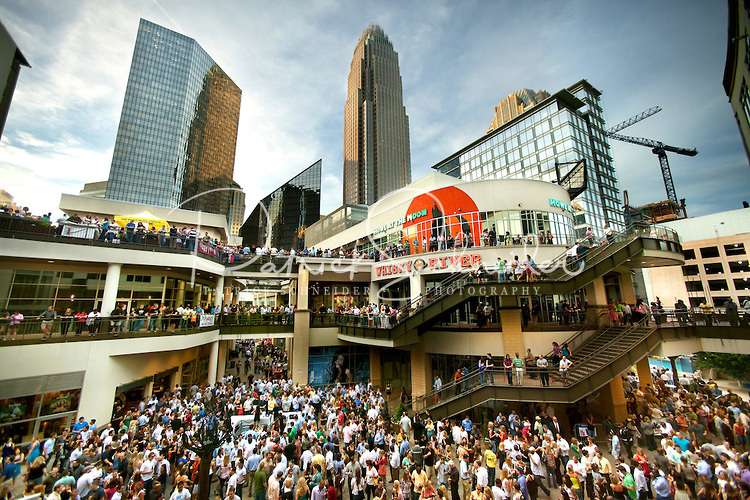 One of the most fun activities in Charlotte, if you’re looking to blend exertion and alcohol, Trolley Pubs allow you and 13 of your friends to have your own, personal bar crawl through Charlotte, all while pedaling and drinking. Charlotte Cycleboats. The hydraulic version of the Trolley Pub, Charlotte Cycleboats bring the fun of pedaling and simultaneously drinking to Lake Norman. Up to 15 people can enjoy a private boat ride for $540, or you and a couple of friends can purchase individual tickets to their open party mixer cruises, and make some new friends along the way. Charlotte Knights Baseball Games. With the spring, comes baseball season and with that comes Thirsty Thursdays! $3 domestics and $5 craft beers all while watching America's favorite pasttime.